On Monday at Alliance High School, an overdose prevention organization struck the hearts of students and staff alike with a presentation that highlighted the traumatic impact of opioids on everyday life. The NOPE Task Force (Narcotics Overdose Prevention & Education), a name that makes itself clear in the organization’s actions. Composed of both volunteers and families affected by drug use, NOPE works to prevent drug-related deaths and overdoses by raising awareness of the issues to middle and high school students. A representative from NOPE, based in Palm Beach County, Fla., began the assembly with a series of photos displaying various teenagers and young adults who overdosed on drugs, telling their stories and warning students against repeating their actions. The story of Alan Hoffman and Stephen Draxler was just one of these. The two teenagers went to a party where the host was handing out drugs for free to everyone who attended. The morning following the party, both teenagers were found dead. The host was charged with manslaughter and is facing multiple years in prison. 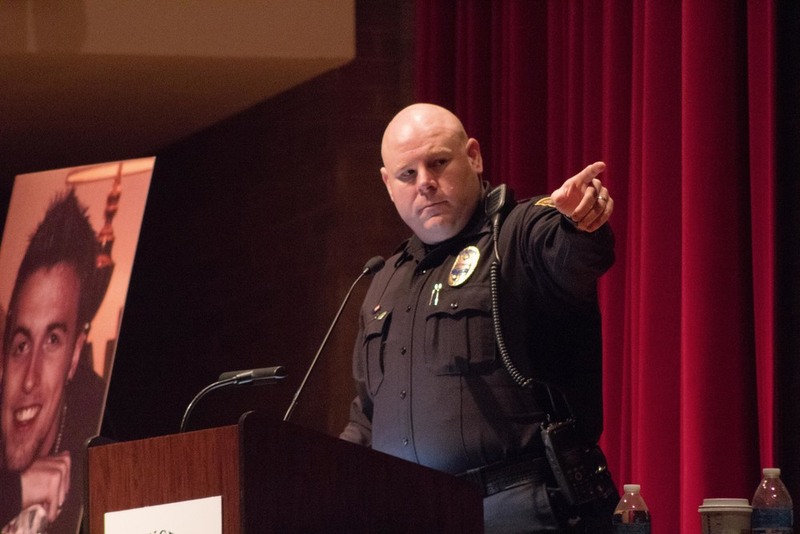 Lt. Bryan Snavely of the Stow Police Department then spoke about his experience with various overdose cases, specifically 17-year-old Aaron Fuhlbruck. Fuhlbruck started abusing prescription drugs and alcohol at a young age, being expelled from high school after being caught with alcohol on school property. Eventually, he was sent to a detention facility and later put under house arrest. One day he overdosed while taking Xanax and Oxycontin with a friend. The friend, too afraid to tell anyone, sneaked out of Fuhlbruck’s house. His mother discovered her son’s body in his room, hours after his death. Students were silent as Snavely played the recording of the mother’s distraught 911 call. He then brought out a body bag, zipping it up to emulate the sound the mother would have heard as her son’s body was sealed in the bag. Snavely ended his story by presenting the urn that contained Fuhlbruck’s ashes, leaving it on a table in clear view of the audience. The representative from NOPE returned to the stage, asking the students in the audience to stand. She requested that they remain standing if they knew someone who had abused drugs. Number of students who were still standing was staggering. The students who were still standing were asked to sit if they had not told someone about this person abusing drugs. Those who remained were given a round of applause for taking the initiative. She then spoke briefly to the students about the importance of getting help if they know someone who is addicted. She introduced Susan Carlyon, mother of 22-year-old Adam Carlyon, who overdosed on heroin. Carlyon talked about her son’s long struggle with heroin, going through several detox and rehab programs only to relapse multiple times. Eventually, he overdosed. Carlyon and her husband rushed him to the hospital after finding him unconscious in his room. Though alive, he suffered severe brain damage and his heart was extremely unstable. His parents were faced with the decision of whether or not to turn off his life support to end his suffering - an impossible decision for a parent to make. 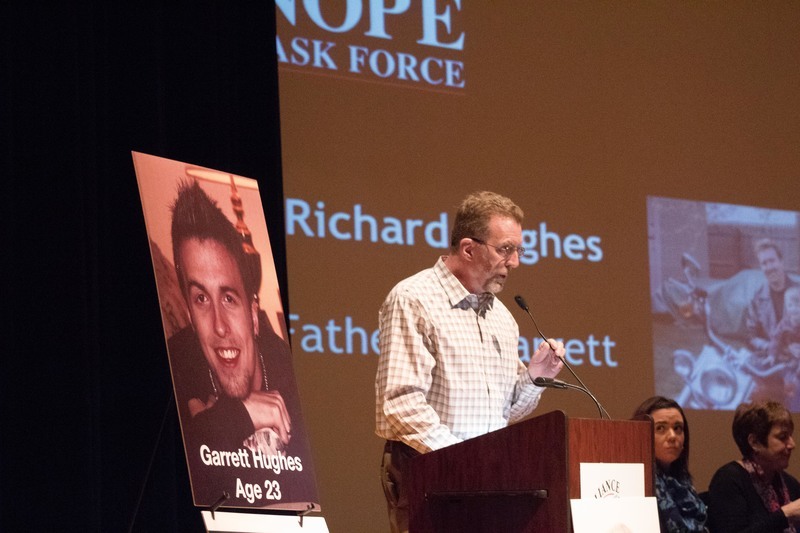 The last to give his story, Richard Hughes spoke about his 23-year-old son, Garrett, and his experiences with overdosing. Hughes’ son was arrested several times for drug-related offenses. Hughes and his wife spent more than $30,000 on a 3-year court battle. As he continued to use drugs, Garrett began to lash out at his parents, attacking and assaulting them. Each time, he couldn’t remember anything he did, even if it had only been a few hours since the incident. One day, he was found dead after overdosing on fentanyl. Hughes ended his time on stage by showing the audience a container similar to the one that holds his son’s ashes. The NOPE representative took the stage for the final time, imploring the students in the audience to speak to someone if they or a person they know is struggling with addiction. The assembly seemed to make an impact on the students. As they were dismissed from the assembly, the hallways were silent.